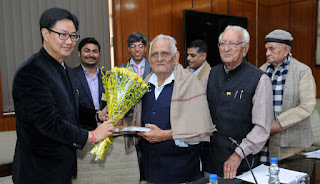 The Union Minister of State for Home Affairs, Shri Kiren Rijiju chaired the 3rd meeting of the Committee of Eminent Freedom Fighters here today. During the meeting the Committee held detailed deliberations on the various issues of concern to the Freedom Fighters. The Committee considered the issues including permitting free education to dependents/grand children of freedom fighters in elementary and higher studies. It was decided that the Ministry of Home Affairs will consult the Ministry of Human Resource Development in this regard and an appropriate decision will be taken subsequently. During the meeting, the Committee’s agenda also included to refresh the memory of freedom fighters in the mind of the younger generation, text book with title ‘our freedom fighters’ may be introduced in each class through NCERT. The Ministry of Home Affairs will pursue the proposal with the Ministry of HRD for promoting the memories of freedom fighters among the younger generation. The members expressed satisfaction on the issues of mandatory transfer of PPOs from treasuries to banks and switch over of PPOs to other nationalised banks also in addition to the State Bank of India. They also mentioned that the ongoing process of verification of freedom fighters and dependents for family pension should be completed at the earliest. The members also expressed happiness over the stay arrangement facility for freedom fighter in Delhi. They requested the MHA to extend this facility to their dependents also. The Committee members also requested for identity cards to be issued to them. The Minister assured them that the MHA will provide them identity cards and their request for extending the facility of stay in Delhi will be examined by the Ministry. The Freedom Fighters’ Pension Scheme (FFPS) was introduced on August 15, 1972 during 25th year of independence (Silver Jubilee Year). Till July 31, 1980, the Freedom Fighters’ pension was admissible only to those who needed financial assistance on account of their meagre gross income; and the minimum pension sanctioned to a freedom fighter was Rs 200/ per month. The benefit of FFPS was extended to all freedom fighters as a token respect (Samman) w.e.f. August 1, 1980 under Swatantarta Sainik Samman Pension Scheme. The meeting was also informed that there is 4% reservation under combined category which includes physically handicapped category, outstanding sports personality and freedom fighters. The committee also discussed the possibility of increasing pensions of unmarried daughters of the freedom fighters in consultation with Ministry of Finance. The issue of allotting petrol pumps and gas agencies to the freedom fighters under their approved quota was also examined and it was decided that the matter will be taken up with the Ministry of Petroleum to ensure that the freedom fighters get their quota properly utilised. The medical facilities to be extended to the Authorised Medical Attendants (AMA) beyond the CGHS jurisdictions was also examined in consultation with Ministry of Health and Family Welfare. Eminent Freedom Fighters Committee has eight members with JS (FF) as Member Secretary and MoS (H) as its Chairman. The freedom fighters who attended the meeting today included Shri Vidhya Sagar Shukla, Shri Radheswar Prassad Singh, Shri Rai Singh Patanga, Shri Guranga Sundar Mitra, Shri N.R. Mathad, Shri Daya Ram Kalwani and Smt Rampilla Narasayamma. The first meeting of the committee was held at Port Blair and the second meeting was held at Srinagar. At the end the Union Minister of State for Home Affairs Shri Kiren Rijiju thanked the freedom fighters for their participation in the meeting and said we must ensure respect for our freedom fighters.